Transcript ~ The Divine Mother: New Year’s Message 2017 | Illuminations Now!! Steve: Good evening, everyone. Linda is going to be channeling Mother Mary, the Lady of Guadalupe, which to me is simply the Divine Mother in form, and it’s going to be our annual New Year’s message. 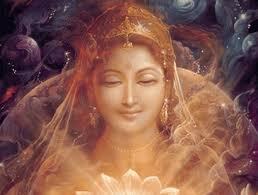 Divine Mother: Greetings. Yes, I am Universal Mother Mary, Mother of Hope, Mother of Change, Mother of Love. But I also come to you this day as Our Lady of Guadalupe – as Maria de Guadalupe. I come to strew flowers and roses at your feet, to crown you with stars, to invite you to this time of fulfillment – the fulfillment of your dreams, your hopes, your promises, and mine, sweet ones; to welcome you and to remind you that this is a time of miracles. Yes, I have come and I have spoken to you about the miraculous and about miracles – as you would call them – long ago. I come this day as Maria, as Our Lady of Guadalupe because for many of you it is your most recent knowing of my presence upon your planet in the very physical manifestation of miracles, of trust, of joy, of faith, and yes, fulfillment. I remind you and I especially share with you, for those of you who do not know the story or the unfoldment of my beloved Juan Diego – a simple man, a simple peasant, that I had chosen to be my emissary upon this Earth – just as I choose each of you my beloved children, mis niños. Too often you shy away, thinking that I am the unapproachable Mother, the Supreme Being, the Infinite and Eternal, Changeable and Unchangeable, the I AM. Well, let us step back down, let us meet in the middle on this wondrous planet, in this wondrous time of bringing to completion one chapter and bringing through fulfillment of this portion and this segment of our unfoldment. When I say ‘our’ I do not simply mean what you construe as the Father and I, or even the Sacred Trinity. I mean our – our family which you are part of, that you have always been part of. And yes, in this new year, in this new time – in my time, 2017, this illusion of separation disappears. No, it is not simply evaporating. Allow, surrender and recognize the isolation, the separation; this tragic belief disappears. As humans, enmeshed in many illusions that have been a human creation, there has been this belief system that has grown up and in many ways solidified, that there is the Godhead and then there are the various kingdoms of the Angelics, the Archangelics, the Seraphim, there are the Ascended Masters and the enlightened beings, there are the star family – the Star beings, and then there are the human beings, and the animal kingdom, the mineral kingdom – and on and on. But you do not conceive, not in your everyday knowing, practice and simple breathing existence, that we are one – that we are a family of one. Now I understand, my beloved ones, that at times it is difficult for you to conceive as I speak of truly the Omniverse or the outer galaxies or other universes, that you have either difficulty or little interest in truly comprehending and grasping that. But in this universe, this reality even that you think of as Gaia or your solar system, your planetary system, which by the way, is much larger than you think! Conceive of this – anchor this truth that I remind you of this day and this year – we are one. I am not some distant Deity needing to be praised, adored, honoured, prayed to. You do this because you love me and you love us and of course those prayers and that adoration is heard and received graciously and with great glee. But what about just talking? What about just visiting? What about simply sitting together? My sweet family, you have placed me at a distance. You have placed me out of reach. You have placed your family out of reach. And so often that has come to be the fulfilment of the belief, that you do not fully feel our presence, our assistance, our guidance, our help, or our love. And that is the most important factor. This is the time of the fulfillment of the family plan. Think of this – in this family plan – that of all the levels of intervention and assistance and things that you ask for, the most important, the most critical for all concerned is that you feel and that you be and that you are in the love. That is everything – that is the Father – that is the Mother – that is the One – that is the All. And if you are not in the joy of that love, if you are not in the action of that love, if you are not in the ‘up close and personal’ experience of the love, then you do not have the wherewithal to go forth in the actual creation of this planet of Nova Earth and the fulfillment of Nova Being – you are already ‘in and out’ of the fulfillment of your ascension. When is the final watermark? It is this creation process, it is not only you accepting and anchoring and being the fullness of your creator self – because you can do that quietly sitting in your room or the privacy of your office. It is taking the actions, being in the stillpoint, the silence, the spaciousness, the dreaming, the expression, the fulfilment of your hopes. This is not – I am not simply your Mother ordering you about, telling you what to do! Consider with me for a moment what the Mother Energy is. There are reasons why you have this paradigm, this archetype. It is the Mother Nurturer, it is the Mother Disciplinarian, it is the Mother who ‘course corrects’ you as you grow. It is the Mother who sees you grow into the truth of fulfillment, the evolution of your maturity on every level. I want you, I ask you, I invite you – I plead with you – discuss your hopes and dreams, your plans with me in the silence of your heart, in the excitement of exchanges. I will let you know – Mi-ki-el, Yeshua, St Germaine will let you know if there is a course correction to be had. Do not, my beloveds, think of any of us as further away than your fingertips – this is what is necessary and desirable, it is what you have always yearned for and what you are most afraid of, and it is time for this fear to be gone. I am not a thundering punishing Mother – nor is the Father for that matter! As humans in this expression of free will you often make what you, in your judgment – you may call it discernment, but then you fall into judgement – you often make mistakes, missteps, and then you often halt – stop dead in your tracks – cowering in some ways and so fearful that you have misstepped that you fall and ask for mercy or want pity. Sweet angels, there is no such thing as mistakes. Are there deviations? Yes, most certainly – on a very grand scale (laughing) and on a personal scale. And has it created situations where there has been need for course correction? Most certainly. We are capable of adjusting. We are capable of more than you can ever imagine, but we want you to imagine, we want your desire, your plans, your heart, the love to explode with potentiality – with the knowing and the belief in miracles. The roses will bloom all over your planet. That is why I have come, because as the Mother in this form, you can expect tangible physical evidence, and I will make this known – no, I am not giving prophesy – that is not my way. I will show you so that you will build your hope and desires, so that you will come to know that you are my ‘Juan Diegos’. You are the children of my breath and you are as close as my breath – and I am as close as your breath! Do not push me away, please. You have been waiting, some of you patiently and some of you not, for the physical tangibility – the fulfillment of this segment – of our family plan. Do not negate it – do not look to the external chaos that now reigns in the United States, Central and South America, Europe, the Middle East, Africa. Everything is being ‘shook up’. Think of it as a beautiful snow globe and in that chaos, in that creative chaos – yes, of your Sixth Dimension – is the beauty. It had need to be shook up, just as long ago I had Juan Diego shake up the Catholic Church, and then again as Pope John XXIII to shake up the Catholic Church! When you are creating change, things have to be shaken up. Now, could it have been smoother? Most certainly! But we work with you because of free will. So be it. Because in that, in many ways the miracles, the co-creations of you and I become more tangible, more obvious. You have always said as you have cried in the darkness of the night, or the darkness of your soul or your passage, “Mother – give me a sign.” Well, my beloveds, I am giving you many, many signs. Not to increase the chaos, but to shake it up enough that there is a new understanding in this of your year 2017, that there is a different paradigm that is emerging and that will solidify and will be the new reality for Terra Gaia. It is not simply done to shake things up, the old – like an old mound of clay reworked – it is taking the creative atoms in the very air you breathe and reforming, restructuring, creating anew. You say to me, “Well Mother, I don’t know how to do that”, and I correct you my child – you have always known. This is a time in many of your traditions where you have exchanged gifts of one sort or another, but I want you to go back and to think even as a child, whether it was Christmas or Hanukkah, or your birthday, when you wished for a certain item – when you wanted that brand new bicycle so that you could fly down the street – and you would tell your parents. But mostly you would lie in bed at night and you would think of that bright shiny bike – not your father’s second-hand one – dear old bike – but your own bright new shiny bike, and you would daydream about it during school and walking home or on the school bus. And then, lo and behold, you would receive that gift! All of you have a very personal example of this kind of dreaming, of this kind of creation. You say, “Yes, but Mother – creating a new planet and eliminating the old isn’t that simple.” You were shown very early how to bring things forth. And then you say to me, “But Mother, there are so many all over the planet that have never had a new bicycle or enough to eat, or who have lived in the shattered ruins and buildings of war.” And that is the truth. Your job – our family undertaking – is to correct that. Our family is very large but completely conceivable, whether it is the animals, with the waters, the air, or your neighbors across the globe, your star family – we are not distant family – your distant family are those who live on Cee Cee Cee in the far reaches of the infinite Universe. This time to begin to think as one, so for those who have never brought forth their creations you are doing it for them, you are teaching them how, you are bringing them along, you are renewing their trust, their faith, and most importantly their hope – and all that is because you are love. We proceed together as never before, so when I say to you in this time and this year that I strew roses at your feet, I mean this literally. I am with you – I am with you in the fullness – the absolute nature of love. Will you do this with me, my sweet ones? I know you will, because you have chosen as this branch of the family to go forth in form – as angels in form – to do this work. And for this I thank you. Now, dearest Steve – my son – where do you wish to begin? You’re a treasure and yet hidden and something that people had to find at sometimes considerable personal cost. And yet here we are in this generation and you’re available to us, not only in this way as on a radio program but in many other ways. I know that a lot of our listeners would like to hear from you your answer to the following question – are Lightworkers who deal in foreign currency for the purposes of irrigating planet Earth and undertaking the various programs like ridding the world of pollution and hunger and poverty protected from things like kidnappings, torture etc? I can elaborate. Let go of the fear, first and foremost. Because as you know, the fear halts and freezes and destroys – eats like acid – it destroys trust, and it also in the freezing mechanism stops you from going forward. Now the short answer is yes. But understand how this going forth happens, and there are many, many aspects and we will not get dragged down into that minutia. But think of it in this way – think of it in the most simple way my child. You have a crush on a boy or a girl – oh, you are about fifteen, fourteen, and these days perhaps twelve – but you are madly infatuated and your heart is going pit-a-pat at a million miles an hour because this is your heart’s desire! But you are shy, you are not confident – you are afraid of rejection and so you never ask this boy or this girl out – you hardly even talk to them. And then of course the big occasion comes and you see the ‘heart’s desire’ go to the party, the dance, the Bar Mitzvah, with somebody else – and you are devastated. But you are devastated because you were too afraid to step forward, and then you think, “Well, the Mother let me down” – even though I was right next to you, cheering you all along, knowing that the expansion of your heart even in this tender romance, not the fullness of Love that I speak of, but that you were afraid to try. When you drop into fear, “Will I be harmed, will I be tortured, will I be shunned, will I be separated from what I love most about my life?” That puts you into fear rather than the forward thrust of excitement and courageousness and bringing forth. Now, having encouraged you to go forth, having provided the mechanisms for that to occur, do you really think in our divinity, in our family, that we are going to arrange for a rogue bandit to harm you? You are mightily protected! You often say, “What is the Company of Heaven doing?” Well, you can rest assured – we are protecting you. That is a promise. SB: Thank you Mother. I’m sure that will have a lot of people relax more. The handling of money is going to raise enough problems unto itself without having to worry about that one. Mother, you talked about Love and I’ve had such difficulty trying to express the fact that true love, what Jesus called ‘real love ,’ what I’ve called ‘transformative love’, others ‘universal love is … I’ve said different … than romantic love. Well, maybe different – maybe I should never have said different – it’s much deeper, as someone said recently. Could you talk to us a bit about the difference between the ordinary love that so much of us feel – which is wonderful, it’s fine – and real Love? The Love that you just described as being the One, the All, You, the Father? DM: Oh, I would love to! Why (laughing) can we not call it ‘Mother Love’? Let us call it Sacred Love. Let us call it love. You have this expression, ‘In for a penny – in for a pound’. Why human beings, you wonderful angels, have dropped into this limitation of love, now that is dissipating, dissolving, disappearing – you notice that we are giving you a new set of ‘disses’ – dissolving, disappearing – yes, dissipating. Your sense of limitation, and each of you in your unique divinity, in your expression of us, have your own parameters based on many lifetimes and this lifetime, of what you think of or feel as love, and it has been restricted and hemmed in. Now, you have yearned to know love and this yearning has expressed in many simply as yearning, but many of you – most of you and this is part of your ascension – are breaking through that barrier as well, and coming to what you dear Steve have called ‘Bliss’ – what many call awakening, expansion – it matters not. But into that knowing and that experience of such unlimited, unconditional, unrestricted bliss, exuberance, joy – all of this is love. What is love? Love is union – it is family union, and I mean that in the sense of we have spoken today – that we are One. Love is union, it is that Sacred Union in many of you look for sacred partners, and we encourage this because it is part of the growth and evolution of the human race, the species, and the human kind – the Gaians. But you don’t really have that until you have entered and incorporated – yes, you might call grounded or anchored – but it really is an incorporation of the love with us. When you come – let us do it right now – be the love with me that you are in the infinity. It is experiential, but it is union. It is the knowing all at once of everything. Some have called it enlightenment. As you have said, some have suffered and died for this experience – you do not need to. I am inviting you to come into this with us in form. I don’t want you to leave your bodies. There are many who will, but there is no necessity. You are to anchor the love and to come to know it, even although it is union I urge you, I want you, I desire for you to know it personally because it is from this that you create the new, that you understand fully and completely how to create the new in union with us, in Sacred Partnership with us. SB: Mother, can I intervene for a moment? Can I just point out to listeners that . . . because I’m more or less in a state of bliss at the moment . . . that in this state of bliss, in this higher dimensional experience that the Mother is referring to of love, things simply become clear, and I think you said once, Mother, that, “I will bring all things to remembrance” – bliss brings all things to remembrance, Love brings all things . . . now, could you explain to the listeners a little bit about how that is . . . how it is that bliss brings – and Love brings – all things to remembrance? When you are in the Love, you do know, and if for some chance you feel that you don’t know, Beloved, it is because there is no need to know – you simply proceed in the truth and the might and the power – the stewardship – of who you are. Long ago the Father has said that this is a family business – oh, I would not refer to it that way, but this is a family unified blissful undertaking. When you are in the Love you are basically reviewing, remembering, bringing up to current date and data, the blueprint of existence. I do not mean the Akashic Records. That is slightly different. I mean the entire blueprint. SB: I have two more questions for you if I may . . . the first is, just what you just said, am I correct in thinking that underneath our core issues and conditioned behaviour and the other detritus of lower dimensional existence we’re already united, we’re already in union – we’re simply restoring our awareness of that by alleviating, by getting rid of these vasanas, these core issues, and the conditioned behaviour that results from them, as if it’s an ‘overburden’ which we just lifted off. Underneath that we’re already united are we not? We don’t need to do anything? DM: We have always – eternally and infinitely and in the moment – always been united as One. So you are getting rid of the illusions, the core issues – yes, important, the vasanas – yes important, the false beliefs – yes, but you are already – we are already One. This is not what you need to seek out or create or discover – you will remember and you will know. SB: Thank you for that. The last question I have – what we talked about is Sacred Love, as real Love, true love. I’m assuming that that’s a Seventh Dimensional experience we’re having, and I hope you’ll confirm that for me in a minute, but the Love that you are, the Love that the Father is, the Love that the All The One is – that has to be an experience of the highest Absolute, so again even real love is only – or what Jesus called real love – is only one step on the path. Is that correct? DM: That is correct. Now, let us explain. When you are in – within the human experience, in the Seventh Dimension of Love – now you tend to think, “Then I have to go Eight, Nine, Ten – and so on”. From there it is the perfect access point to all Love – the Love. Your expression in experience of that is Seventh Dimensional, flowering out into all existence, all dimensions, all realities, all timelines, so you are the blossoming of Love in your Being as well, and as you blossom you ablate the next blossom and the next blossom and the next blossom – I was not simply being emphatic when I have suggested to you that each of you touch and participate in 144 million other lives. Current – what you think of current – times, yes, some are on other planetary systems, many are on board ships, but this is your experience of Union. And that experience is also allowing you to be in true genuine – what you would term as authentic – relationship, marriage, partnership, because that is truly what a marriage is. Not all the legalities that have come to be put in place – marriage is the union in love of two souls in form. That is it – and that is everything. SB: Oh Mother – Is there anything you want to say in closing? DM: Yes. As we have suggested, why I have come forth as Our Lady of Guadalupe, as Maria, as Mare, is to speak to you of miracles. Not miracles of Above or Below but of All. You are the fulfillment of these miracles. You are the wonder of my Heart, you are the wonder of my Soul, my Being, our Essence, our Love. Keep me close – I am your Mother. I wish to live with you within your heart, your soul and your life. I am with you – let us go forth in this fulfillment. (1) One hears rumors of the Divine Mother’s incarnations and manifestations but seldom an acknowledgement from the Divine Mother herself that is She who has incarnated or manifested. Given western skepticism of incarnations of the divine, this kind of acknowledgement from the highest source anyone will ever speak to is invaluable. This entry was posted in ascension, Channeling, Contramimi/Contramary, God, love, Lovelight, Persönliche Entwicklung/Personal Growth, Reblog, Reflections in the transition time by contramimi. Bookmark the permalink.